The streamlined design of the new series of Sennheiser D 10 wireless DECT headsets makes no compromises when it comes to exceptional sound. Its single connectivity to either a desk phone or softphone/PC makes it plug and play simple to roll out and manage - the perfect headset solution for all sizes of companies. D 10 puts the freedom of a wireless solution within reach of even more everyday users. The D 10 Series offers the choice of 3 wearing styles. Choose between single-sided headband, ear hook or neckband. 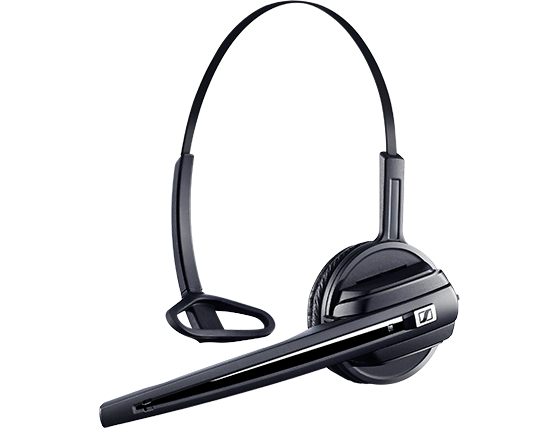 All headsets are for both left or right ear wearing and they all fit in to – and can be paired with the same base station. The neckband is available as an optional accessory. Click-on adapter from HSA 20 accessory needed for mounting. 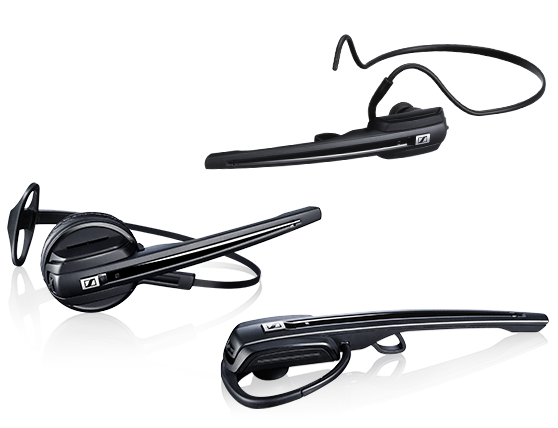 With the D 10 Series’ single connectivity, you can choose a headset solution either connecting to a desk phone or a headset solution for use with a softphone/PC. Experience quality sound on the move as you roam around the office. Wireless freedom extends your working range so you’re always within reach. 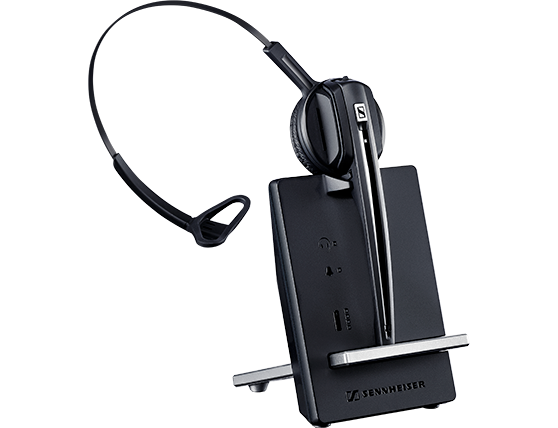 Typical office building: up to 55 m. Line of sight: up to 180 m.
For the best possible communication between caller and listener, Sennheiser Voice Clarity uniquely enhances the most important frequencies and details of the human voice. For the caller, sound is crisper and clearer, allowing them to hear the nuances contained in spoken conversation – and for the listener, a noise-cancelling microphone sends the clearest signal to improve intelligibility. In combination this results in better, more natural sounding conversations where no important details are lost. Thanks to intelligent fast charging, the D 10 Series headsets deliver a full day of talk time for a comfortable, worry-free connection in the office.  Up to three additional guests can join the same conference call by simply docking the headset to the same base station. There is no interruption and it is very fast and convenient for guests to join the same conversation. 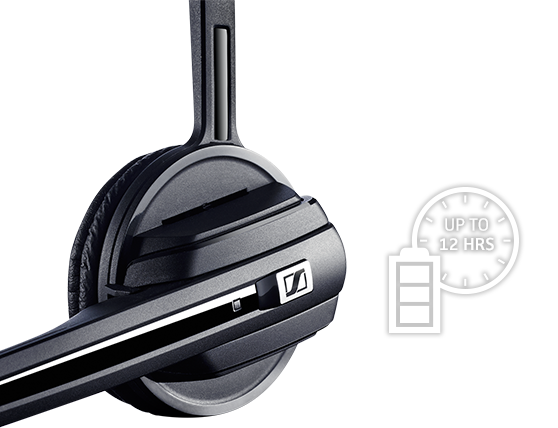 Patented Sennheiser ActiveGard® hearing protection technology protects users from the potential danger of acoustic shock from unexpected and sudden sound bursts on the line. Please be warned that the sound without ActiveGard® can be extremely high.